Hupy and Abraham has been a long-time client of Foster Web Marketing. Since November 2008, we have been helping this Midwest law firm develop its brand, improve the look and functionality of its website, and add killer content. Launched in 2016, the new website does not just look great, it is also performing very well. The biggest change has been in its site speed. Their new site, including the mobile version, is blazing fast, scoring extremely well on Google’s PageSpeed Insights tests. Site speed is important to the user: nobody waits for pages to load anymore; an impatient user simply clicks back and goes to another website. Likewise, site speed is a huge ranking factor for Google, so the faster a site loads, the better the chance that it will rank well. 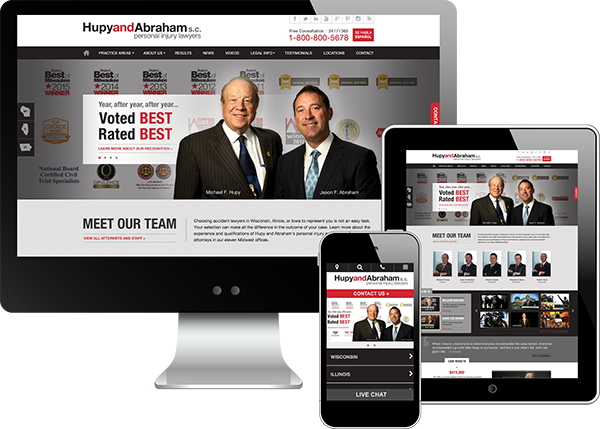 Another major change we made was with Hupy and Abraham's website’s color scheme. Its old website was orange and black, a theme that matched the branding color of their motorcycle-centric practice. However, this time around the firm's partners were ready for a change and went with a crisp blue and white. These colors went better with their image as an all-around personal injury law firm and had a cleaner feel. Below, we discuss three other major design elements that have played significant roles in the success of the law firm's new website. What we did: Before the redesign, the website wasn’t as user-friendly as it should have been. One of the major issues was that when the user shrunk the window (didn’t view it in full-screen), much of the content and many of the elements on the page were hidden. Now, the site responds to a smaller window and shrinks to fit. Why does it work? Users no longer have to scroll from side to side to see the entire page. This is important because people do not have the patience (or, sometimes, the know-how) to scroll around a page; they want information and they want it now. The same applies to Hupy and Abraham’s mobile site. Now, the site responds to the device it’s being used on. Users get a different, simple-to-view and -use site, dependent on whether they’re using a desktop, laptop, tablet, or smartphone. What we did: The homepage is a panel-style design. This emphasizes the different areas of the site and encourages scrolling, making it easy for visitors to choose their path. Buttons were also used to highlight the three states in which Hupy and Abraham practice. This helps sort potential clients based on the state they live in. Aside from the home page, the interior pages have a left-side bar for the different modules to avoid “right rail blindness,” or the tendency for Internet users to ignore the right-hand side of a web page. Why does it work? The homepage panels encourage visitors to choose a custom path to internal pages of the site. This increases engagement and conversion as the potential client becomes more involved in the site, finding all of the answers he or she seeks in one place. Also, with easy-to-find and navigation-friendly state buttons, potential clients are given information that relates directly to their situation and region. What we did: Hupy and Abraham is well known for the events it puts on and the charity work it does in its community. To help highlight these events, we added a Google event calendar to its website. Why does it work? The law firm has a passionate following in the motorcycle community. This calendar allows its audience to keep up with the rides and other events that Hupy and Abraham is involved in. Best of all, interested parties can subscribe to the calendar so that they don’t miss a thing. This enhances the law firm's image as a community partner and keeps it on the minds of their audience—always a good thing!